Sections of the South West Coast Path near Boscastle in Cornwall have been closed because of flood damage. The decision has been taken by rangers working for the county council's Countryside Service. 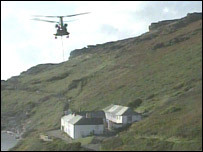 The council says the Boscastle and St Genny's sections of the path will be shut until further notice. Local people and holidaymakers are being urged to use alternative routes between Bude and Tintagel instead of the Coastal Path. The force of the floodwater on Monday caused major ditches to be opened up along the footway. Trees were uprooted and 14 bridges in the area were washed away. The council estimates the damage will cost more than £250,000 to put right. Countryside Service Land Access Manager Mike Eastwood says they are making it a high priority to fix the damage caused. Meanwhile, residents have power again thanks to the Army which flew in emergency generators on Thursday evening. The Army has also lent firefighters special equipment to detect all of the cars that remain submerged in the village's harbour. On Thursday, the overall command of the post-disaster operation at Boscastle was handed to North Cornwall District Council by Devon and Cornwall Police. Fire crews remain at the scene, helping residents who need to inspect the extent of the damage to their properties. One year after the devastating deluge, how is the village coping?